A bolster pillow is a long narrow pillow. It can be used as a cervical pillow, though it is not specifically designed for that application. Yet most bolster pillows are firmer than a body pillow or generic plush pillow. It can be used to prop up an arm or leg. They’re often used in yoga and by those seated for long periods of time, softening posture and reducing pressure on joints. Here are the top 7 best bolster pillows. The Gayo brand meditation bolster pillow is ideal for those who want to sit on the floor, whether in a meditation pose or yoga positions, without putting a hard load on their spine. Yet its rounded rectangular shape makes it work as a cervical pillow, too, such as when you’re lying flat and need some support for your back. Or put it under your knees to raise them just a little when you’re in bed, avoiding the bulk of large wedge pillows. One benefit of this model is its size. 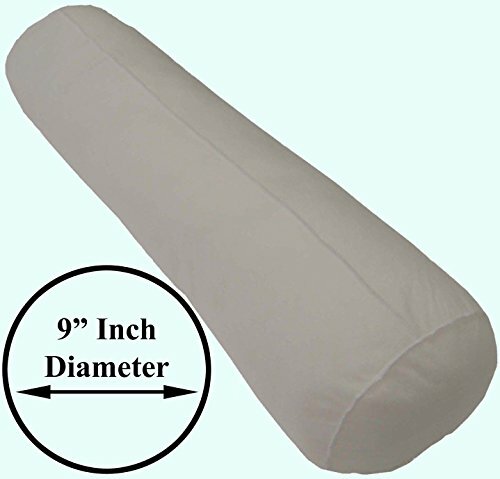 It is 18” x 12” x 6”, shorter than many other bolster pillows, and weighs only four pounds. This means you can fit it in many bags and take it with you, whether to yoga class or work. It is available in both black and purple. The only weaknesses of this model is the offgassing, and if you machine wash the cover in warm water, it shrinks. The cover also attracts lint, though this isn’t an issue if you’re doing yoga on wood floors. This bolster pillow is made with supportive foam. It is ideal for putting under a joint or section of your body for support. The manufacturer recommends it for use during massage, but it is a good choice for the general public. In fact, the professional grade bolster pillow is durable for long term personal use. Another benefit of this model is the cover; you can wipe it down with soap and water to clean it if you’ve been sweating on it or spilled something on it. You can comfortably put it under your knees, neck or feet – whatever you need to elevate and keep steady. And the strap handle makes it easy to take with you. The Earthlite bolster pillow is available in a number of colors. And it is quite affordable given its durability and quality. For some, the stiff cover along with the solid inner material is too firm for overnight use. The vinyl cover is also cool to the touch, whereas a cloth cover would make it warmer. This brand of bolster pillow is designed for comfort during extended use. This is an ideal bolster pillow for sitting on the floor, a bench or un-ergonomic office chair for extended periods of time. And you can use it to elevate your legs or feet at the end of the day. This bolster pillow is full width plus some; it is 24” long, 6” high and 12” wide. If you need to adjust the thickness or shape, unzip the zipper and remove batting to make it fit your body. If you need full support under your hips while you sit or a broad, soft surface to elevate an arm or leg, this is the right bolster pillow for you. It is available in a dozen different colors. The cover can be removed and washed in a washing machine. Unlike other foam filled bolster pillows, you can spot clean the core if it gets stained. And it has handles on both sides so you can easily adjust it or carry it. One issue is that the cover barely fits the fully stuffed volume, so you don’t want to alter the stuffing level unless you’re going to permanently thin it. It also smells for several weeks after you buy it. Bolster pillows are often used to prop someone up in bed or elevate one’s legs for an extended period of time. The Foamily brand bolster pillow is a cross between a wedge and a bolster pillow. You can use it to allow someone to comfortably sit up in bed for hours or maintain proper leg positioning with something with a broader shelf-life than a rest pillow you buy specifically for use after surgery. Or use it to turn a day bed into a couch others can recline on. A side benefit of this bolster pillow is its greater overall thickness, if 6” isn’t enough for you. This bolster pillow doesn’t come with a cover, but you can find compatible covers online. The manufacturer has sometimes shipped used pillows as new. If they’re damaged in shipping, you don’t get any support. The NapYou brand bolster pillow is a multi-purpose pillow. It can be used as a neck pillow or back pillow; the shredded memory foam gives it the right level of firmness and form fitting softness to work almost anywhere you want it. Or use it as a support pillow for a broken arm or raise up swollen feet. One of the benefits of this pillow is that it is totally washable. If you use it as a back pillow or between your legs and have an accident, you can wash the whole thing. You cannot remove the cover to wash it separately. Conversely, the entire thing can be run through a dryer on low heat, too. The cotton exterior is also ideal for those with skin problems, since it is non-allergenic while being relatively soft. It is affordable and relatively durable. It will retain heat, if this is an issue for you. The cover doesn’t quite contain the fine particles from inside, so it sheds. It is supposed to be firm but can go flat if used overnight. Brielle Stream is a linen brand, and many already own blankets, pillows and curtains by this company. What many don’t know is that they sell bolster pillows, too. The company makes a basic 18” long, 6” diameter bolster pillow in a dozen different colors. It coordinates with other Brielle Stream products. The cover is removable and machine washable. It gets points for its low cost and stylish covers that blend in with any décor. It is soft and lightweight. Use this bolster pillow if you want a small, discrete bolster pillow instead of a large foam roll. You need to be careful not to damage the zipper while taking it off. The zippers have a tendency of breaking. The colors shown don’t always reflect the exact color you receive. Sometimes six inches just isn’t enough. Sometimes you need a thicker bolster pillow because you’re so tall that other bolster pillows are too small to fit behind the small of your back. Maybe you need a bigger bolster pillow to support your feet or neck because you’re more curvaceous than average. Another benefit of this bolster pillow is its length. You can find them as long as 60”. If you want a single bolster pillow that runs the entire width of your bed, this is the right pillow for you. Buy one and install it, and you don’t have to worry about mixing and matching smaller pillows or trying to put them in place. The outside cover is hypoallergenic. One downside is that the cover has to be hand washed. Removing the cover is very difficult. They retain a chemical smell. Their larger size means that shipping these pillows costs more than other options on this list. 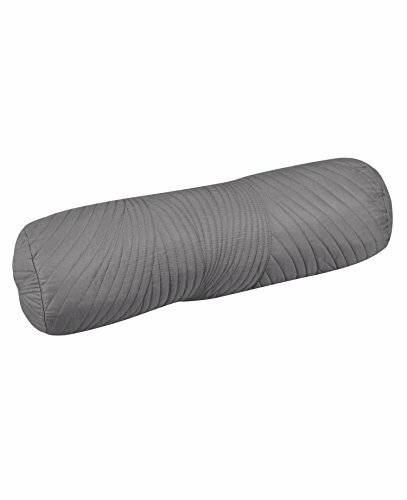 If you’re looking for a portable, versatile bolster pillow, Gayo has the best bolster pillows for you. If you want a bolster pillow you can wipe off after hot yoga or a hot flash while sitting in a chair, the Earthlite pillow is right for you. Yoga Accessories bolster pillows are the right choice for those who need a full sized bolster pillow suitable for sitting on for hours. The Foamily booster pillow can be used for sitting and reclining on as well as elevating a limb. The NapYou bolster pillow is ideal for those who need something washable and versatile. Pillowflex is the best bolster pillow for those who need something much bigger than average. If you’re looking for a bolster pillow that blends in with the rest of your bedding, you want the Brielle Stream bolster pillow. Pillowflex is the right choice if you need something thicker or longer (or both) than the average bolster pillow. What Kind of Pillow Should You use?